I'm sure we're all thinking 'where is this year going?!' Am sure it's a sign of getting older! I have quite a few empties this month and first of all I apologise for the quality of the photos in this post-I finished some things in my first trip to Cairo earlier in April and didn't want to bring them back to Dubai so took photos of them in the hotel. Then today when I was trying to take the rest of the photos I had somewhat of a camera mis-function then a very grumpy boyfriend who has come home and gone straight to bed meaning the rest of the photos have been taken on my iphone. Note to self-must plan better! I also thought this week I would be in Cairo for work and would then heading straight from Cairo to London for my friends wedding so this post *should* have gone up whilst I was in Cairo so I wanted to schedule it for the 30th. However that trip has actually fallen through meaning a panicked flight cancellation and re-booking from Dubai to London and £800 down the drain thanks to the awkwardness of a certain airline I shall not name. But I am waffling...let's get on to April's empties. Loved this sea salt heavy shampoo. It was featured in my April 7/11 post so you can read all about it there and how it's weird but good! I must buy some more when I am in the UK as I discovered it was DOUBLE the retail price at Lush in Dubai-shame on you Lush! I wouldn't usually review a shower gel as I normally just buy supermarket brands-AND I know you can't get BABW in the UK so it's a bit mean to include it but I really do love this shower gel. It smells delicious-really calming and soothing and perfect before bed. It's a really thick and luxurious gel and well worth spending a few extra pounds/dollars/dirhams on. Because it is such good quality you automatically need to use less and so this lasted me ages. This is a creamy but abrasive body scrub. I didn't like it as much as the Body Shop Sweet Lemon Body scrub which I reviewed here. The kernels in this scrub are set in a cream whereas the kernals in the lemon version are set in a gel. I found the lemon scrub to be so lovely to use, it didn't feel as abrasive but was equally as effective and was so easy to wash off. This scrub was more difficult to wash off without leaving residue. This was a travel size lotion I received in a birthday gift. I was a little reluctant to try it because I thought it might be very heavy and sticky but I was so pleasantly surprised!! It was lovely and rich yet felt light and easily absorbed on the skin leaving a lovely sheen and moisturised skin all day. I much prefer this to a body butter. I literally devoured this bottle, I loved it! It was not heavily scented so won't interfere with your perfume if you apply it after your morning shower. If you have read any of my other empties posts you'll probably not be surprised to see this delightful duo featured again!! These 2 are my holy grail eye make up removers! You can read my reviews here of why I love these two so much! Would I repurchase? Is the Pope Catholic? What have I replaced it with? The same products! I picked up these handy make up remover swabs from Cult Beauty and I love just having them in my handbag to clean up any mascara smudges. Very effective and easy to use, my only criticism is that it would be better if they were individually wrapped so I didn't have to carry the whole box around with me and could just chuck a couple in my handbag. Would I repurchase? On the fence really...have found since using an eyelash primer I haven't been suffering any mascara smudges-I do think these are useful though. What have I replaced this with? See above! This is one of Illamasqua's most popular products and is the translucent 'white' shade. I couldn't get this in any of the Dubai concessions and ended up buying this in the UK and having it shipped it me. Plus sides-this didn't leave the 'ashen' powdery effect I found when I used the Make Up For Ever version of this powder. The smell is delicious-it's like sweets! It lasted ages and ages. The downsides-You can't travel with it as the powder just falls into the lid meaning when you open it it's full of powder and very messy. 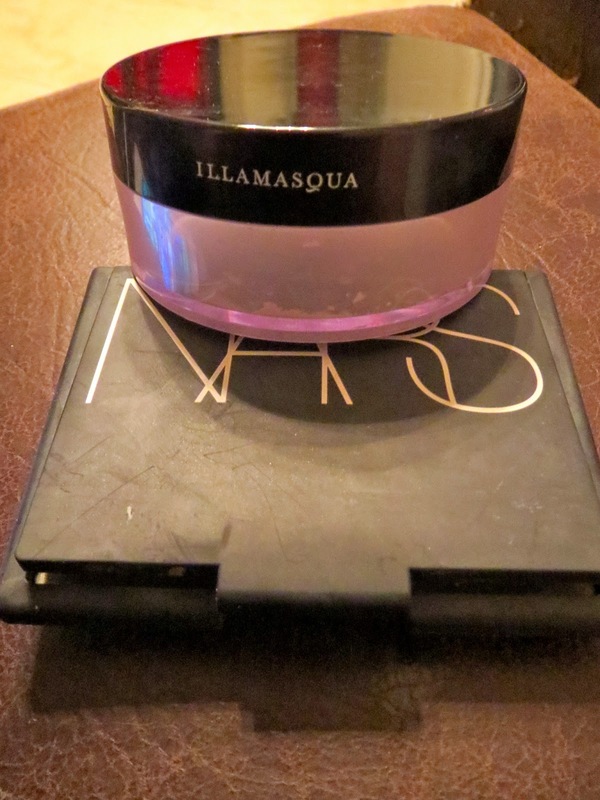 I travel a lot so I left this at home and took the below Nars powder with me which was similar but in a pressed format. What have I replaced it with? Various powders on the go at the moment-but the setting powder I am using is the Mac Prep and Prime translucent setting powder. This is a great product that again I featured in my March 7/11 post. It's not chalky at all and leaves a really nice sheen on the skin. Brilliant for travelling, my only criticism is that I hit pan really quickly and it didn't last more than a month. Would I repurchase? It's such a difficult call because there are some amazing new powder launches at the moment-Hourglass have brought out their amazing range of Ambient Light powders and Chanel have brought out Les Beiges. I love discovering something new. This soothing lotion has been my morning eye cream for what seems like months! It's the never ending tube of eye cream! It's more of a lotion than a balm and I found it to be quite basic-very suitable for sensitive skin and provides a nice smooth base for under eye make up. One of my favourite discoveries of 2013! This lash primer literally doubles the length and thickness of your lashes, stops any mascara smudges throughout the day and means your mascara looks as perfect at 8pm as it did at 7am. It's literally amazing. It has a slightly thick texture you apply before mascara before the primer is dry. What have I replaced this with? I am now convinced that lash primers are a vital part of my every day make up routine!! I have bought the Lancome Oscillation Power Booster lash serum to try and it has a much thinner texture than the Mac one. I don't like it as much as it doesn't seem to make my lashes quite as full. This was a GWP I picked up last summer. This is the waterproof version of the best selling smoky lash mascara. Being waterproof I would have expected it to be smudgeproof but I found when I applied it to my lashes it did smudge under my eyes. That's a big turn off for me when it comes to mascara. However, I did find that on a particularly emotional day I did put the waterproof aspect to the test and it was indeed waterproof. When I combined it with the Mac Prep and Prime lash the smudging disappeared. It definitely volumises and lengthens (again I think this is the effect of the lash primer) and is very black-which is a big plus in my book. However, it's not as amazing as mascara's such as the Lancome Hypnose Star and YSL Faux Cils and the brush shape made it difficult to get right to the roots of the lashes. I used to wear this when I was younger and it has a certain nostalgia and evokes certain memories in me. I bought this back in December and have been wearing it-I like the fact it's light and suitable for day. I also like it when certain smells evoke certain happy memories-who doesn't? y Miyake and Molecule 01. Finally I finished up these 2 Bath and Body Works candles. These are the travel size ones and I pack them on my business trips to burn in the room and make it feel more homely and less like a thousand people have stayed in the room before me. I love the light and fruity Cranberry Pear Bellini and the Energy candle is flavoured with Orange and Ginger for a burst of sharp scented energy. I've got lots of Bath And Body Works candles so I would probably wouldn't repurchase these specific ones as BABW are always bringing out new varieties. I will however always travel with one of their candles as they make me feel quite comforted in foreign climes! I love reading empties posts so please link me to yours below! !